Barack Obama stepped to the brink of victory in the Democratic presidential race Tuesday night, defeating Hillary Clinton in the Oregon primary and moving within 100 delegates of the total he needs to claim the prize at the party convention this summer. Clinton countered with a lopsided win in Kentucky, a victory with scant political value in a race moving inexorably in Obama's direction. With 83 percent of the votes counted in Oregon's unique mail-in primary, Obama led Clinton 58 percent to 42 percent. With all precincts reporting in Kentucky, Clinton bested Obama 65 percent to 30 percent. Obama won enough delegates Tuesday night to claim the majority of all pledged delegates to be elected in primaries and caucuses, reports CBS News. Obama has 1,649 pledged delegates to Clinton's 1,496. That total does not include Michigan or Florida. In Kentucky, CBS News reports Clinton will win 35 delegates and Obama will win 14, with one left to be allocated. In Oregon, Obama will win 28, Clinton will win 19 and there are five unallocated. "This continues to be a tough fight, and I have fought it the only way I know how - with determination, by never giving up and never giving in," Clinton told supporters in Kentucky. "I have done it not because I've wanted to demonstrate my toughness," she said, "but because I believe passionately that for the sake of our country, the Democrats must take back the White House and end Republican rule. ... That's why I'm still running and that's why you're still voting," she said. 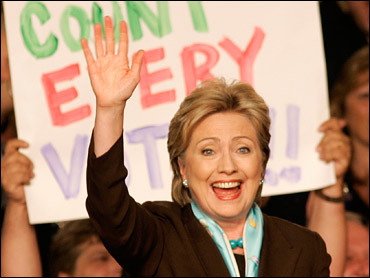 Clinton claimed the popular vote lead in her speech to supporters, counting the disputed Michigan and Florida primaries. "This is one of the closest races for a party's nomination in modern history, she said. Obama spoke before some 6,000 supporters at an outdoor rally with the Iowa Statehouse as a backdrop, celebrating in the state where his win in the opening contest of the presidential primary season helped reshape the race. "Tonight, in the fullness of spring, with the help of those who stood up from Portland to Louisville, we have returned to Iowa with a majority of delegates elected by the American people and you have put us within reach of the Democratic nomination for president of the United States of America," Obama said. In Kentucky, just 33 percent of Clinton voters said they would back Obama in the general election if he is the Democratic nominee - 42 percent said they will vote for Republican nominee-in-waiting McCain, and another 23 percent say they won't vote. More Democrats also felt Clinton was the best candidate to beat McCain in the fall. Oregon voters felt differently when asked about their feelings about the candidate they did not vote for, according to the exit poll. A majority of Clinton and Obama voters in the state would be satisfied if their opponent got the nomination. And 68 percent of Clinton voters say they will back Obama in the general election if he is the nominee and 80 percent of Obama voters say they will back Clinton in the general election. However, a majority of Oregon Democrats said they thought Obama would be a stronger general election candidate in the fall. Democratic voters in both states said the economy was the most important issue, with 67 percent of voters in Kentucky saying that. Voters differed, however, on whether to suspend the gas tax was a good idea. In Kentucky, 59 percent thought it would be good idea and 37 percent said it would not be. In Oregon, 64 percent said they thought it would be a bad idea and 26 percent said it would be a good idea. Since the vote is by mail in Oregon, the exit poll was taken by telephone and completed on Sunday. In Kentucky, Clinton won among almost all key demographic groups in the state, according to the exit polls. She won 67 percent of women and 64 percent of men. She won 79 percent of blue collar whites. By wide margins, she won those earning less or more than $50,000 and those with or without a college degree. In Oregon, Obama won most demographic groups. He won male voters 65 percent to 34 percent and women voters 51 percent to 48 percent. Obama also carried those with or without a college degree and those who made more or less than $50,000. Clinton won blue collar whites in Oregon, but by a much smaller margin than she did in Kentucky - 54 percent to 46 percent. Clinton won among Kentucky voters who decided in the last week and those who decided in the last three days. However, Obama won those voters in Oregon. CBS News correspondent Dean Reynolds reports that Obama wants to further the impression that he is the big winner Tuesday without painting Clinton as the big loser. He also pointed out the significance of the delegate milestone in an interview with CBS News. "What it means is we've won the majority of delegates that have been assigned by voters during the primaries and caucuses," Obama said. "Hopefully we'll be able to secure the nomination in the coming weeks and then focus our attention on the real choice that the American people are going to have." In fresh indications that their race was coming to an end, Clinton and Obama praised one another during their speeches and pledged a united party for the general election. "While we continue to go toe-to-toe for this nomination, we do see eye-to-eye when it comes to uniting our party to elect a Democratic president this fall," said Clinton, whose supporters Obama will need if he is to win in November. "We have had our disagreements during this campaign, but we all admire her courage, her commitment and her perseverance," Obama said of his rival and partner in a marathon race through the primaries. "No matter how this primary ends, Senator Clinton has shattered myths and broken barriers and changed the America in which my daughters and yours will come of age." But in a sign of confidence on the front-runner's part, party officials said discussions were under way to send Paul Tewes, a top Obama campaign aide, to the Democratic National Committee to oversee operations for the fall campaign. While Obama lavished praise on Clinton, he focused his attention on the general election battle with McCain. Obama said he would leave it up to the Arizona senator "to explain whether his policies and positions represent long-held convictions or Washington calculations, but the one thing they don't represent is change." "This election is fundamentally about who Americans can trust to secure peace and prosperity for the next generation of Americans. Without a doubt, Barack Obama is a talented political orator, but his naive plans for unconditional summits with rogue leaders and support for big tax hikes on hardworking families expose his bad judgment that Americans can ill-afford in our next president," said Tucker Bounds in a statement. In the fundraising chase, Obama reported cash on hand of $46.5 million at the end of April, all of which can be used for the general election. Unless he takes federal funds, he is permitted to raise as much as he can. McCain reported almost $22 million cash on hand. Unlike Obama, McCain is expected to take federal funds for the fall campaign, which total about $85 million and bar him from raising other donations for his campaign's use. Clinton reported $30 million cash on hand at the end of the reporting period, but also almost $19.5 million in debt. "We still have work to do to in the remaining states, where we will compete for every delegate available," Obama said in an e-mail sent to supporters. "But tonight, I want to thank you for everything you have done to take us this far - farther than anyone predicted, expected or even believed possible." Clinton looked for a consolation for the strongest presidential campaign of any woman in history. She hoped to finish with more votes than her rival in all the contests combined, including Florida and Michigan, two states that were stripped of their delegates by the national party for moving their primary dates too early. A Democratic convention committee is to meet on May 31 in Washington to decide how - and whether - to seat delegates from the two states. The candidates paused during the day to express best wishes to Sen. Edward M. Kennedy, the Massachusetts Democrat suffering from a brain tumor. "So many of us here have benefited in some way or another because of the battles he's waged, and some of us are here because of them," Obama said. Said Clinton: "As a lifelong champion for social justice and equality, his work has made the path easier for me, for Senator Obama and for countless others. He's been with us for our fights and we're now with him in his." "I have said on numerous occasions, I have described Ted Kennedy as the last lion in the Senate," said McCain. "And I have held that view because he remains the single most effective member of the Senate if you want to get results. He is not reluctant to share the credit. And when he fails, he is willing to take the blame."